For the second time in three years, the Laval Rouge et Or are the U Sports women’s soccer champions. 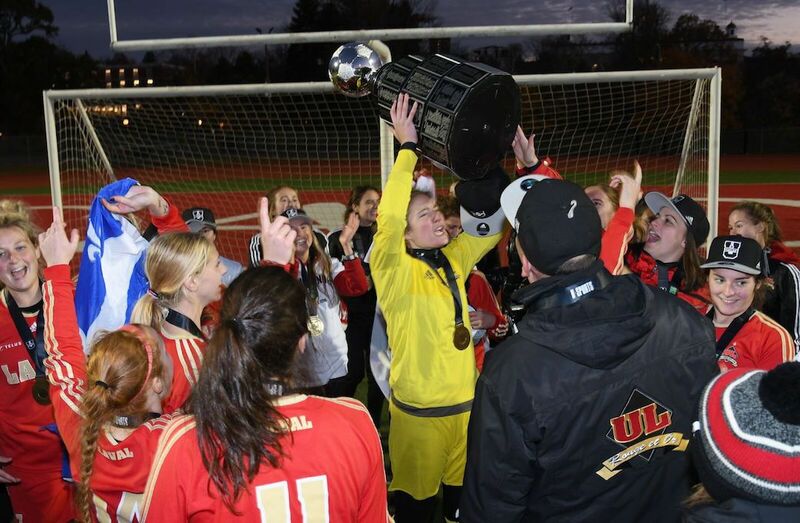 Laval, the tournament’s second seed, captured the U Sports banner and the Gladys Bean Memorial Trophy with a 2-1 win over the top-seeded UBC Thunderbirds Sunday afternoon, Nov. 13 in Wolfville, N.S. In an exciting and well-played final, the Rouge et Or opened the scoring at the 17:42 mark of the first half, when third-year forward Joelle Gosselin (Quebec City, Que.) scored her fourth goal of the tournament. The score remained 1-0 until the 54th minute, when UBC’s Aman Shergill (Surrey, B.C.) was awarded a ‘dot shot’ penalty kick following a collision with Laval keeper Marie-Joelle Vandal (Lavaltrie, Que.) outside her crease area. Shergill made no mistake, burying the penalty shot to tie the score. With only minutes remaining in regulation time and extra time looming, Laval’s Lea Chastenay-Joseph (Quebec, Que.) netted the game-winner at the 87:18 mark on a medium-range shot that cleanly eluded UBC keeper Marlee Maracle (Oakville, Ont.). 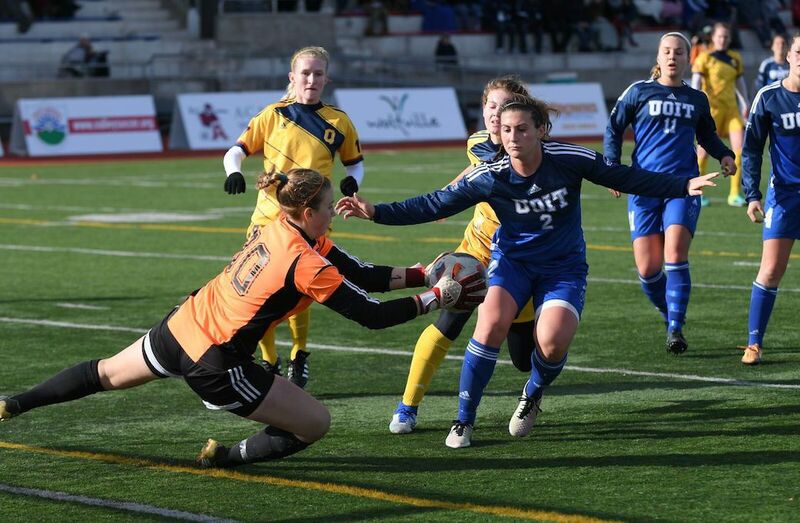 Gosselin, one of a number of Laval players who were also on the 2014 Rouge et Or team that captured the CIS Championship on their home field, was named the tournament MVP. “It feels great,” Gosselin said after the game. “The final accomplishment of what we’ve worked for all season. From the first game of the season, our goal was to win nationals.” Gosselin acknowledged the Rouge et Or had come to Wolfville “with only one goal: to win it all.” They advanced to the final with a 5-0 quarterfinal win over Saskatchewan and a 2-1 overtime victory over UOIT in the semifinals. The final accomplishment of what we’ve worked for all season. From the first game of the season, our goal was to win nationals. After the game, the three medal-winning teams – UOIT, UBC and Laval – were all presented with their respective medals, and the Rouge et Or received the championship trophy and banner. Also as part of the post-game ceremony, the tournament all-star selections were announced, along with the tournament MVP. Chosen as all-stars were Jenny Wolever from Queen’s; Kylie Bordeleau and Katherine Koehler-Grassau from UOIT; Jasmine Mander, Aman Shergill and Marlee Maracle from UBC: and Melissa Roy, Lea Chastenay-Joseph, Gabrielle Lapointe, Arielle Roy-Petitclerc and Gosselin from Laval. Gosselin was also awarded the tournament MVP award.